Eclectic Eel: February-March Guest Blogger! It is generally accepted that if you are an editor, it is more than likely that you are also a writer. The Eel and her Small Fry are no exception, but how many of us can say that they write poetry in a second language? The Eel certainly can't - she struggles saying hello to the fish she meets in the warmer climes she visits when on holiday. The Eel has a lot of admiration for the writers out there who, like Mamta, are able to not only write in a second language but produce fantastic work. 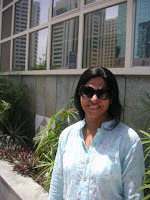 A regular contributor to the Eel's issues and a curator at www.gotpoetry.com, the Eel is thrilled to welcome Mamta to the Eel's Guest Blogger's platform where Mamta discusses what we love best: anything and everything to do with writing! To check out Eel's interview with Mamta, go to the Guest Blogger's section!